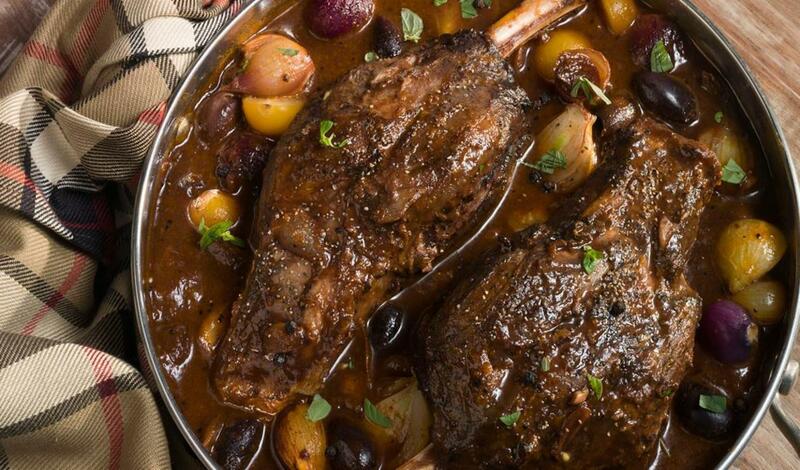 Seasoned lamb is braised with shallots, garlic and red wine, then cooked with onions, peppercorns and Mediterranean seasoning. Lamb shanks, 10 total 10 lbs. Onions, shallots, minced 3 T.
Oregano, fresh, minced 3 T.
Season lamb with salt and pepper. Heat the olive oil in a heavy pan and sear the lamb on all sides. Remove and add the shallots and garlic. Cook until aromatic and the tomato paste. Cook out tomato paste. De-glaze with red wine and add Mediterranean Demi-Glace (sub recipe below). Remove the lamb carefully and degrease the sauce. Add the pearl onions, tomatoes, and oregano. Simmer until the onions are tender and add the olives. Ladle the sauce over the lamb shank and serve immediately. Suggested sides include couscous or creamy polenta. Saute the shallots and garlic in butter until aromatic. Deglaze with red wine and reduce by half. Add to hot demi-glace and finish with butter.